Our 6 frame nucs are on self spacing frames with 4 to 5 frames of brood at all stages (eggs, larvae & sealed brood), frames of food stores and a marked Queen, green for 2019. Our nucs are mostly headed with Buckfast or Carniolan queens however we may also have some nucs that are headed with Ligustica and Mellifera Mellifera queens that we could supply. See our queen pages for information regarding the specific races. Please note that if you do order a specific race we cannot guarantee to supply that race although we will do our best. All our bees are gentle and are suitable for beginners and the experienced beekeeper. Our first Spring Nucs will normally be ready towards the middle of May and then through to early August, though this is weather dependent and orders are fulfilled in order of when they are placed with us. We understand that most of you will be excited to receive your bees but we do ask for you to be patient as until the season fully kicks in it is very difficult for us to convey time scales. As soon as your nucleus of bees is ready we will get in touch to let you know. Your nuc will be ready, bursting at the seams and be ready to be transferred into a full size hive when it leaves us. To give you an idea of how the years can differ, last year our orders started going out early June but 2017, 2016 and 2015 saw nucs go out in middle May, 2014 our spring nucs went out in early June, 2013 they were not ready until the end of July and in 2012 they were ready mid June. This is down to the weather which cannot be foreseen. We are often asked by customers if they can inspect their nuc on the day of collection. Unfortunately, this is not possible as we close the bees up the evening before collection to ensure you get all of the flying bees. If you were to open the nuc and inspect it on the day of collection you would lose too many bees which would compromise the quality of the nuc. We do guarantee all our nucs for a short period of time and offer you full telephone support should you need it. We will always do our best to offer advice and help you to sort out any problems you may have. The correx travel box takes 6 frames and is essentially just a transportation box however it does also make useful swarm collection box. 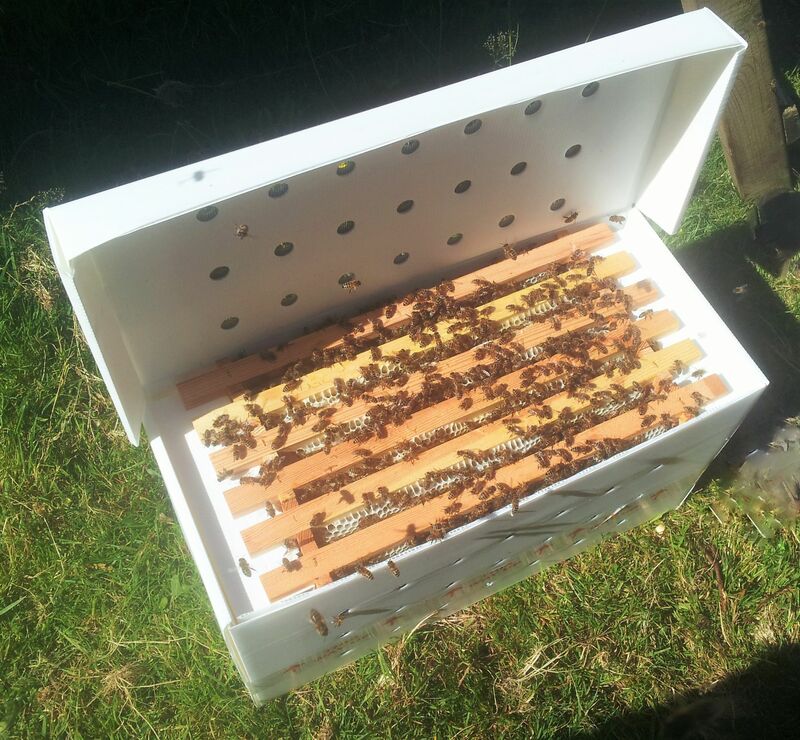 The box is very light, it is ventilated on the back front and the top and is 100% bee proof. The box also has carry handles on the sides and we can send bees in our box with a courier if you do require delivery. The polystyrene nuc hive also takes 6 frames, it has a built in feeder and an open mesh floor. It is easy to transport the bees in the poly box and it is a handy piece of kit to keep in your bee shed. It is made from high density polystyrene which is very strong and has great insulation properties, keeping the bees cooler in the summer and warmer in the winter. We suggest you bring a cam buckle or ratchet strap to go round the nuc when you collect. If you don't have straps we sell them or we can take the box for you. Nucs ordered in poly nucs boxes are collection only, if you require delivery please order a nuc in a correx box. If you are looking for bees on 14x12 frames click here. Delivery cost to any UK Mainland address is £48 per nuc and is guaranteed next day delivery before 1pm*. We are taking orders now, you can place an order on-line with a deposit of £40 or you can email your order to me with your full details and I will email the invoice for the deposit. The balance plus any delivery costs will be due for payment just prior to collection*/delivery. *Collection is always the better option for your nuc as it is less stressful to the bees. However if you do require delivery of your bees we can organise this for you. Please contact us to discuss ways we can help if you live a distance from us and would prefer to collect. We request that all buyers register their new colonies with Beebase the National Bee Unit website. It is designed for beekeepers and also supports Defra, WAG and Scotland's Bee Health Programmes along with the Healthy Bees Plan, all of which help to protect and sustain our valuable national bee stocks. There are no costs involved with registering with Beebase, instead it gives you, the beekeeper, the security to know that should a bee health problem arise in your area, your local bee inspector will notify you about it, and if necessary come and inspect your colonies, free of charge. By buying your bees from us you are giving us permission to pass your details on the NBU if they ask for them. If you don't give us permission to pass you details onto them in the event they request them then please let us know at the time of ordering. Please note that all deposits are non-refundable unless we cannot supply your order however if you do have to cancel we will issue you with a gift voucher to spend with us so you don't loose your money.